Sometimes I feel really sorry for my family. 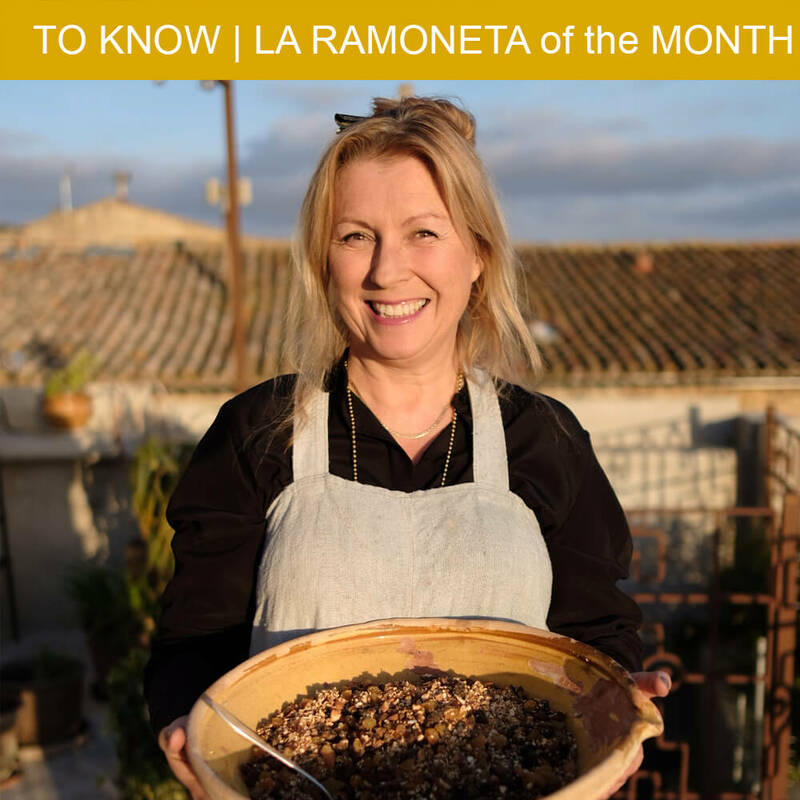 It cannot be easy to be dragged to the Pyrénées-Orientales department – about 1.5 hours from our home – just because their blogging wife/Mum wants to take a photo of the peach trees in bloom. Regardless, this is exactly what I did a few weeks ago. 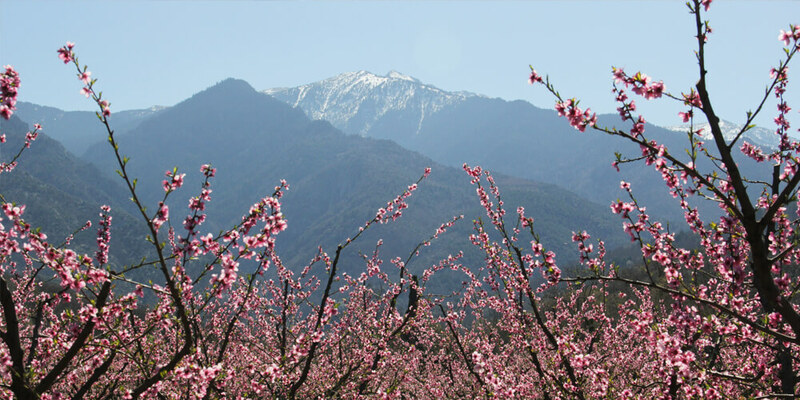 The sky was a perfect blue, the summit of the Canigou was still white with snow and the peach trees were covered with beautiful pink flowers. And I managed to get Chéri and our mournful brood in the car by promising them a Sunday lunch. 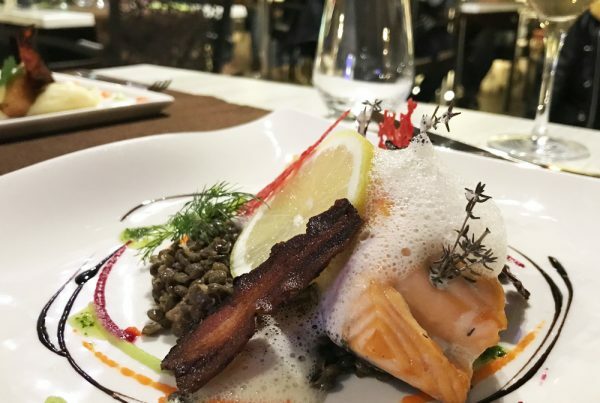 Which turned out to be a great treat at the unique bistrot du pays El Taller in Taurinya. As I was looking for the right spot to take the perfect picture, I didn’t really pay much attention to which restaurant we should go to. Very unlike me… After a quick look on Tripadvisor, I decided to make a reservation at El Taller. 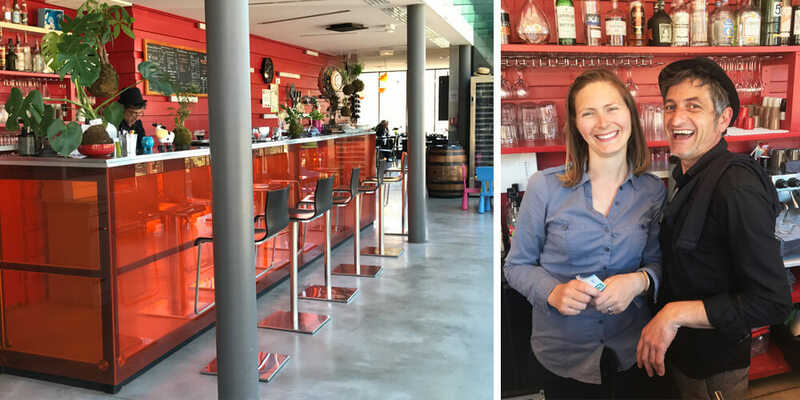 Taurinya is a sleepy little village, but the El Taller restaurant is modern and very stylish, which took us by surprise! As the weather was just brilliant, we could even sit on the terrace, outside in the Spring sunshine. In March! To celebrate, we ordered an aperitif to match our festive feeling: a glass of champagne with a hint of lime and cinnamon. 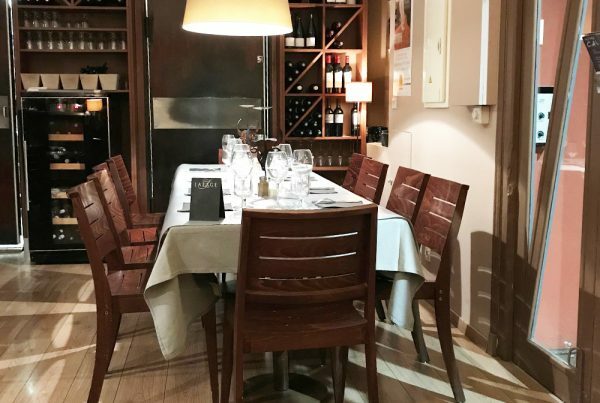 El Taller offers several menus, from 20 to 42 euros. However, each menu gives you a range of choices per course, so it almost feels like you’re eating à la carte. The twins could still order the children’s menu, with freshly cooked fish. The oldest was too old for a child’s menu, so he got the leg of lamb, which came at the same time as the twins’ main course. 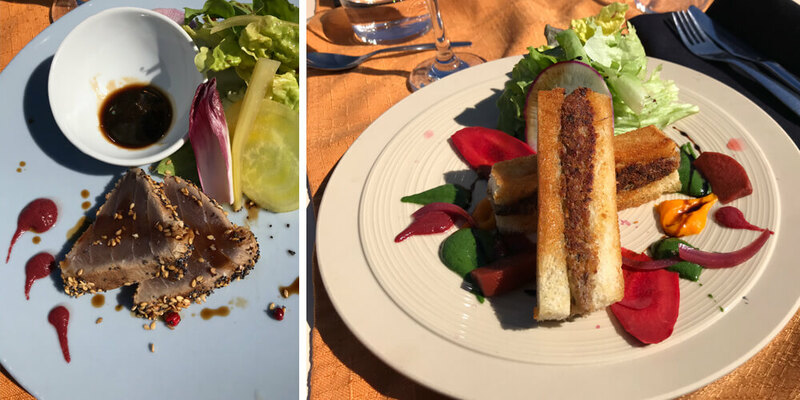 Meanwhile, we enjoyed our starters: slices of tuna in soy sauce and crispy sardine fingers in ‘Croque Monsieur’ style. Unfortunately, we weren’t the only ones who loved it, as the kids stole some bites before we even noticed… Our main courses followed without too much of a wait. 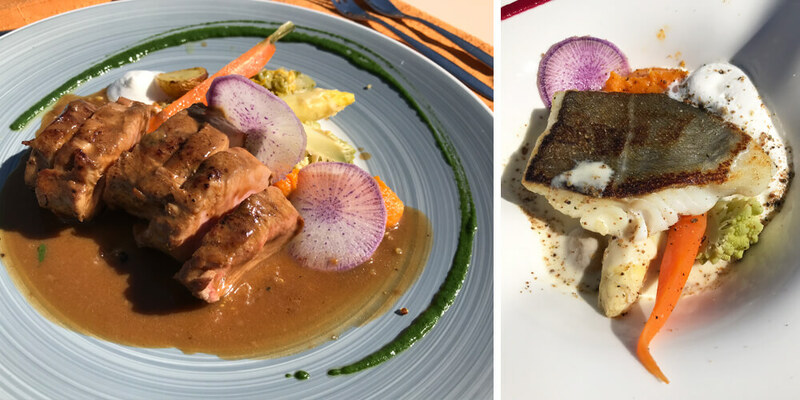 Chéri had a tender, juicy pork tenderloin served in a rich fois gras sauce. I stayed with the fish theme and had a cod fillet with a lovely, light fennel sauce and seasonal vegetables. 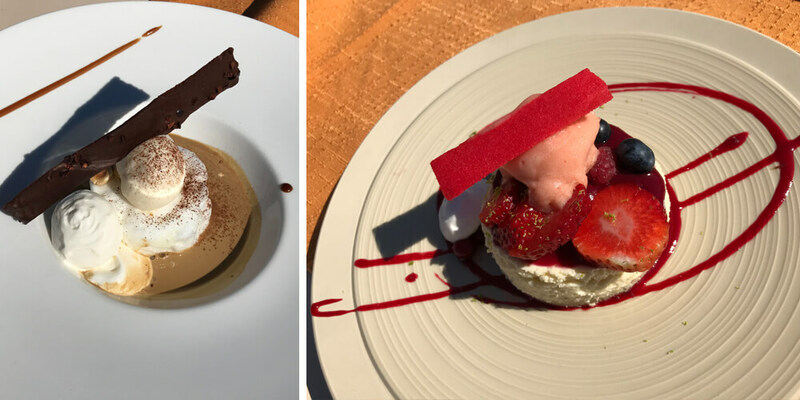 The desserts, included in El Taller’s 32 euro menu, consisted of a vanilla cheesecake with a coulis of red berries for Chéri. He didn’t want to share any of it, so it must have been good. I was perfectly happy with my ‘Île Flottante’ El Taller style. Instead of the classic vanilla based crème anglaise, the cream was made with chicory, which gave it a very original flavour. It didn’t feel like I was eating chicory at all. In fact, I only found out what the flavour was when I was writing this post, after looking up the meaning of the word ‘chicoré’. El Taller managed to surprise me well beyond our fabulous lunch! Oh, and below you’ll see one of the (many) pictures I took of the blossoming peach trees :). 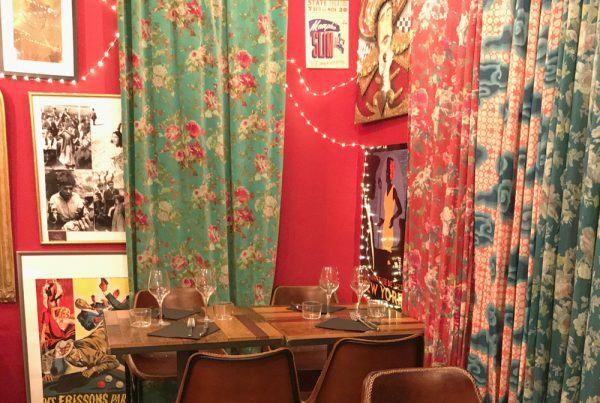 El Taller is a Bistrot du Pays set up by a couple of welcoming friends who wanted to share their bright way of life. Sylvain and Laurent are the chefs that run the kitchen, while Claire and Stéphane host the guests. The restaurant itself is strikingly beautiful if you’re into modern architecture. El Taller also organises art exhibitions and concerts, check their website and facebook page for updates. I suggest you also check the website for opening hours, as they aren't open every day. And definitely make a reservation before you visit! For your information: the Abbaye of Saint Michel de Cuxa is close by, just a thought if you wanted to combine food and culture.